As the director of the Sanger Centre in Cambridge, the British arm of the international effort to map the entire human DNA sequence, John Sulston was at the very forefront of this cutting-edge research. The ultimate success of the project, despite innumerable setbacks and rogue challenges from outside competitors, is in large part thanks his determination, diplomacy and scientific know-how. The resulting wealth of information promises to be the biggest scientific and medical breakthrough in modern history. In this intimate personal account John Sulston takes us behind the scenes of the largest international scientific operation ever undertaken. He reveals the politics, controversy, ethics, personalities, setbacks and accomplishments that shaped the seven years of research. He is frank about the competition with Craig Venter and Celera Genomics that threatened to undermine the attempts by the international community to make the sequence available for all humanity. He shares with us his obvious passion for science. He takes us into closed-door meetings with Tony Blair and Bill Clinton. 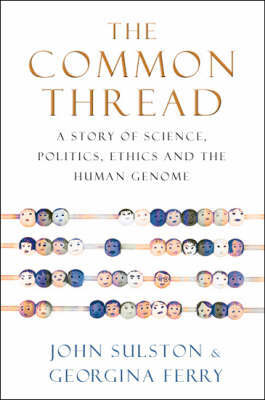 And as a pragmatist he shares his hopes and concerns as to how the information unlocked by the Human Genome Project will affect people's lives in the near future, how this information (and future gene sequencing) should be protected, and conjectures about how this astonishing breakthrough will lead medicine, science and our understanding of our selves.